The ultimate party boat in Cabo San Lucas is now available for private charter just for your group! Groups of all sizes are welcome, and of course we offer our famous discounts. You can charter the Jungle Cruise for snorkeling, whale watching, sunset cruise, or the ultimate booze cruise for your group. We provide two suggested itineraries for you, but feel free to request a custom itinerary if this doesn't quite fit with your needs. We are happy to accommodate. This is the one, the only, Cabo San Lucas Booze Cruise. There is no other booze cruise in Cabo San Lucas this wild, this crazy, or this much fun! The FREE ALL-YOU CAN DRINK BOOZE will be flowing throughout the cruise, with dancing, reggae and party music, beer bongs and of course, drinking contests! If you're here for the famous Cabo San Lucas Spring Break, or just to have a great time and have fun in the sun, this is the tour for you. You'll enjoy beautiful views of El Arco as the sun sets over the Pacific, and have a great time. Get ready to loosen up and get crazy - IT'S PARTY TIME! Daily on your schedule. We recommend to let us choose the time based on sunset, but you are free to adjust as you wish. Start times after 7:00 PM will require an extra $100.00. $2.00 Per Person for Marina Fee. Groups of less than 55 people can upgrade to the larger boat for $300.00 extra, choose the upgrade option at check-out! Enjoy the sunshine as you cruise to Santa Maria Cove, where you'll snorkel in one of the best snorkeling locations in Cabo San Lucas. Admire El Arco (The Arch) as you pass by Land's End where the Pacific Ocean and the Sea of Cortez meet. After snorkeling, lunch is served, the bar opens up and the P-A-R-T-Y begins! The music cranks up to 10, the beer bongs come out, and wild and crazy dancing and partying abounds as you cruise back to port. 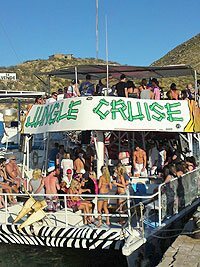 There is no other tour in Cabo that can compare to the Jungle Cruise for pure wild fun! Groups of less than 50 people can upgrade to the larger boat for $300.00 extra, choose the upgrade option at check-out!